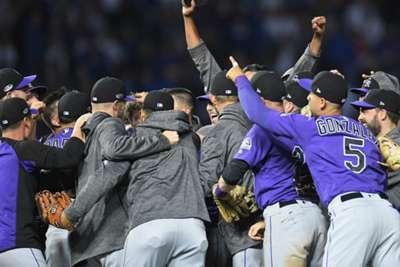 The Colorado Rockies took down the Chicago Cubs in the longest sudden-death game in MLB history on Tuesday. Colorado, fresh off a tough 5-2 loss to the Los Angeles Dodgers in the one-game playoff for the National League West, topped Chicago 2-1 in 13 innings on an RBI single from an unlikely hero. Kyle Freeland was masterful on paper in Tuesday's wildcard game as he tossed 6.2 shut-out innings while allowing just four hits and one walk. But the Cubs did all they could to help extend Freeland's night by failing to force a three-ball count until the sixth inning. 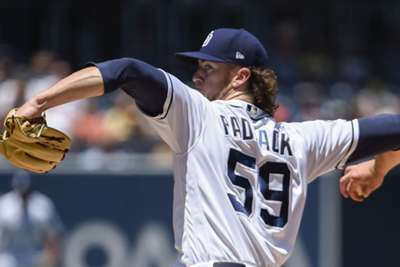 Freeland, who was on three days rest, threw just 58 pitches through five. So was Freeland's success a product of great pitching, or was it simply Chicago's fault for failing to make the 25-year-old work more by fouling off pitches and getting into deeper counts? There are of course two sides to every story and it is easy to make an argument for the latter, but the truth is, Freeland really was masterful in the zone all night long. The Rockies' ace threw first-pitch strikes to 14 of the first 17 batters and 18 of 24 on the night. He lived on the corners all game long and limited hard contact. Freeland's ability to move his fastball around the outer edges of the strike zone made his evening. The Cubs really could not have done much to counteract that. When asked about his decision to start Daniel Murphy at second base against lefty Freeland before the game, Maddon asked ESPN: "What are my other options?" Murphy then went on to go 0 for three against Freeland and left runners on base in both the second and seventh innings. While the veteran played second base, Ben Zobrist played right and Jason Heyward sat on the bench. Did Maddon have other options? Of course he did. In fact, he had a couple of better options than Murphy. The waiver deadline acquisition came into Tuesday's game batting .219 against lefties in 2018. Heyward was hitting .290. Kyle Schwarber, who could have played the outfield while Zobrist could have played second (he played 58 games there during the year), was better than Murphy against lefties at .224, though that is a small difference. Tony Wolters is on the Rockies postseason roster for one reason and one reason only: he is one of the best pitch framers in the game. Despite playing in just 74 games this season, the former infielder finished eighth in all of baseball with 9.9 framing runs, according to Baseball Prospectus. In other words, he earned his pitchers a lot of strikes they did not. Wolters may be known for his glove but his bat spoke for him on Tuesday.